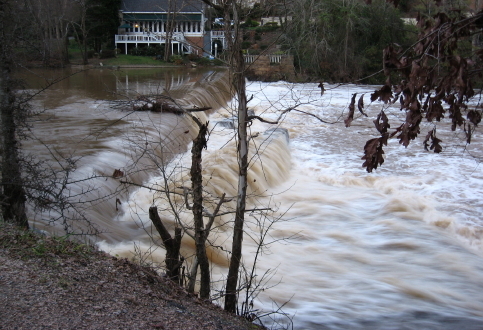 The previous post talked about Crabtree Creek’s tendency to flood – last week again brought heavy rains over the Crabtree watershed that brought the creek up to the edge of its large channels. 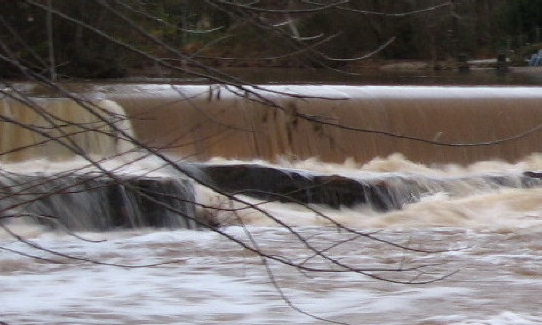 This also sends an impressive load of water over Lassiter Mill Dam, as seen above. I shot a video clip of the rushing water from below the tailrace, as linked below. 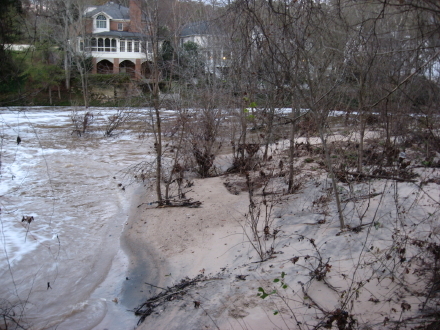 What happens at Lassiter Mill vividily and intensely demonstrates what happens lots of places more gradually – the deposition of new soil by spreading flood waters. 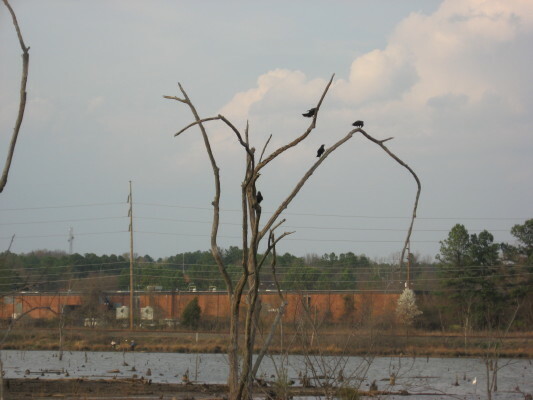 This is an essential part of the natural systems of the Piedmont, and our flood control measures prevent the process from periodically enriching the soil with a layer of mud and silt – though the process continues to work just fine in the “waste” lowlands that remain in Raleigh. An astounding number of these lowlands have become major thoroughfares – roads built relatively later in Raleigh’s long history, on land left undeveloped due to the floodplain. 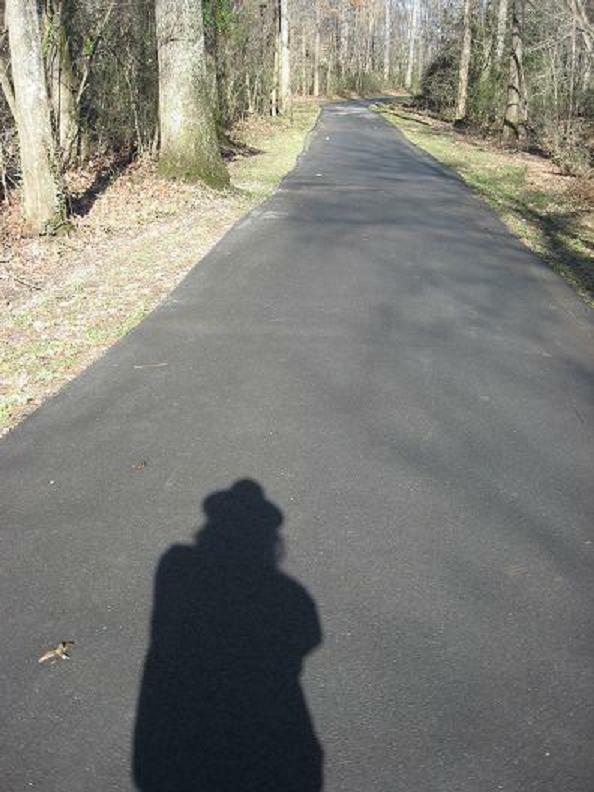 The Beltline follows the low contours of Walnut Creek, House Creek, Crabtree Creek, Big Branch, Marsh Creek and then Walnut Creek quite precisely as it curves from Cary’s Buck Jones to Glenwood, over the crest of North Hills, and around southeast to Poole Rd and then Lake Wheeler Road. The water is piped and rushed away from underneath these elevated roadways, carrying its minerals with it. The suburbs and businesses near these roads certainly don’t need the sediments! But the stuff has to go somewhere, and these days there is a lot of stuff. 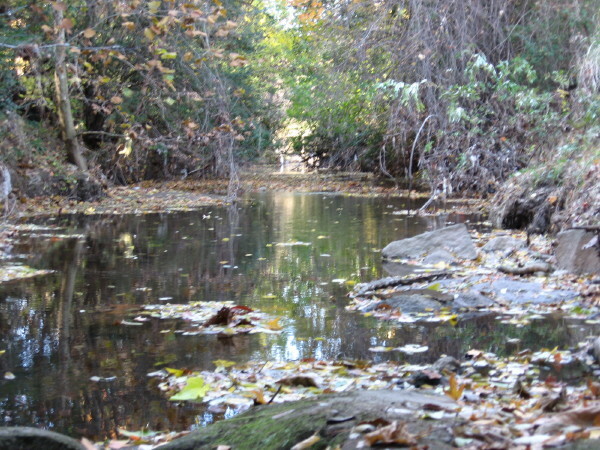 When streams are buffered by a healthy band of water-loving trees and shrubs, erosion material is reduced greatly. In central Raleigh, Crabtree is clogged with lots of dislodged soil, construction materials and unnaturally exposed red clay. 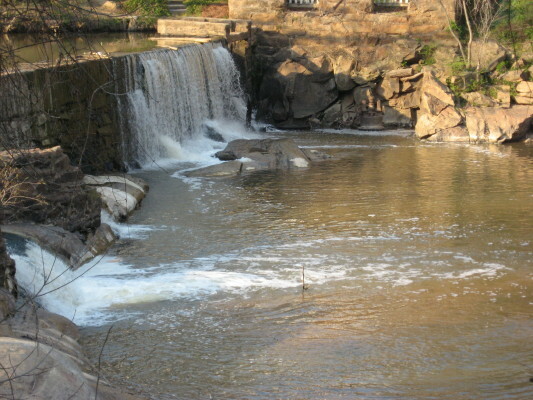 But the deposition process is a vital one, and it gets exaggerated at Lassiter Mill, where the water brings its load of suspended minerals hurtling over the dam and then slows and spreads its course below. 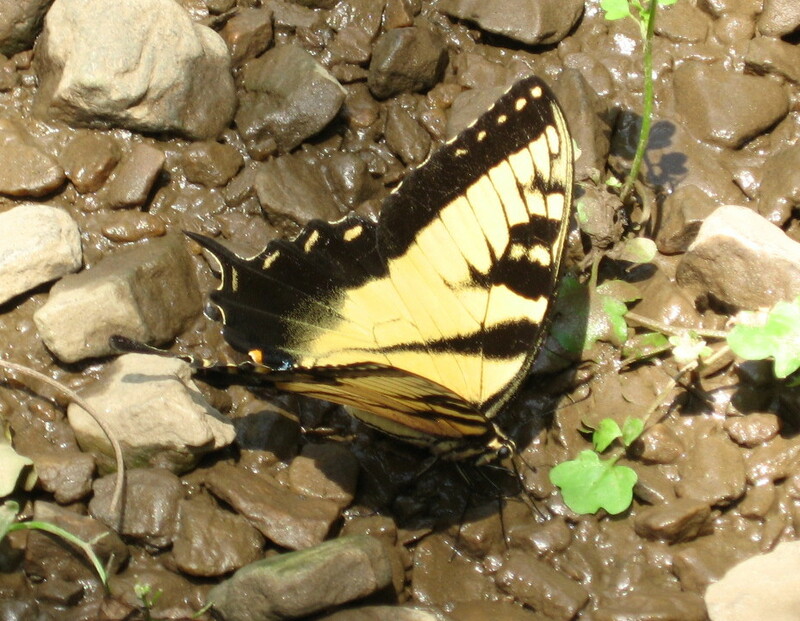 As it slows, it drops much of its sediment load. 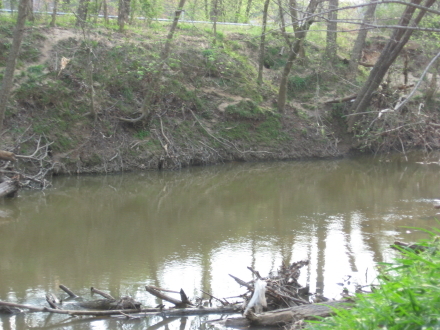 The area below Lassiter Mill changes yearly as the creek alternately erodes and builds up materials. Check out the new load of sand deposited by the recent high waters. There are several caveats and complications to consider. This is a large load of sand! Eight or nine inches at a dose, and not the silt and mud that the plants would prefer. But nature adapts, and the Lassiter “beach” is fun to browse, with a wide variety of weeds incubated from the loads of soil and debris. The silt and sand that currently washes down Crabtree is terribly unhealthy for the filtering mussels and other delicate aquatic life. The red clay that paints Crabtree brown is such a strong pigment that Crabtree often changes the color of the Neuse where it conjoins. 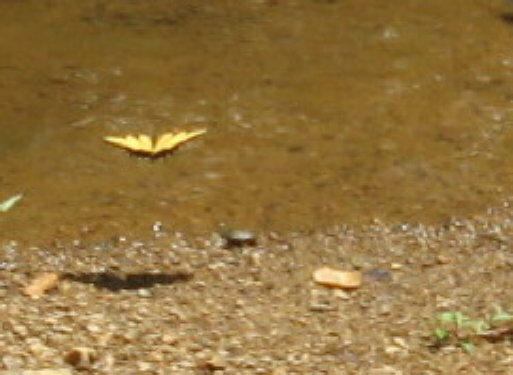 Crabtree builds itself “shoulders” as it repeatedly overflows, dropping the heaviest particles first as the water disperse into the floodplain. 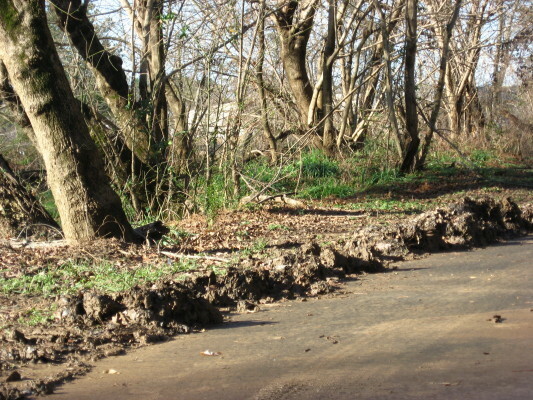 This is why Crabtree presents such a tall ditched appearance as above at Hodge Road. The plants arrange themselves in an orderly sequence beside or on top of these embankments according to their tolerance for flooding. The next time Crabtree rises over it’s banks, put on your rubber boots and check out the glistening mica-rich silt that covers the greenways before the city sends its scrapers to clear it off to the side, where it enriches the plants as well as any landscaper’s mulch. You are walking in the stuff that makes our floodplain soils, a rich muck delivered by the yearly floods. I recently had an opportunity to document the Southern Living photo shoot of one of Raleigh’s most interesting residential landscapes. 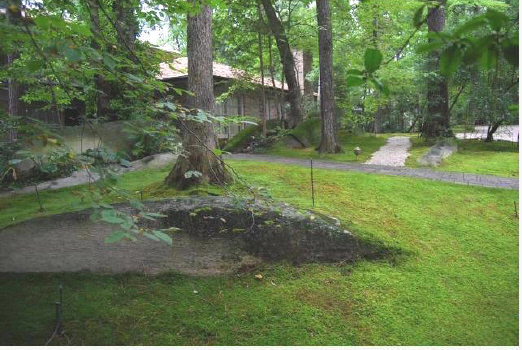 The Southern Living article about the moss garden at the Urquhart residence on Marlowe Drive will come out in about a year – we’ll return to that incredible piece of landscaping, and promote the article, closer to the publication date. In the meantime, I wanted to introduce Raleigh Nature readers to David Spain, Richard Urquhart’s son-in-law, who has cared for the property since Urquhart’s passing in 2008. 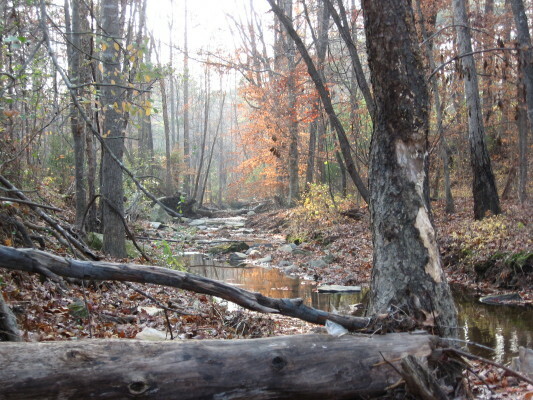 David follows Raleigh Nature and has been very encouraging of my efforts to portray the Lassiter Mill section of Crabtree Creek, which adjoins the Urquhart property. 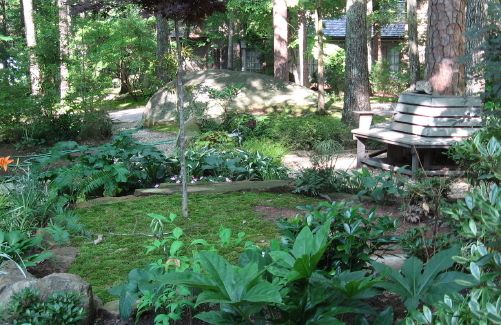 This post shares some of his photography and offers a sneak peek at the moss garden, which senior writer Steve Bender at Southern Living describes as the finest he’s ever seen. 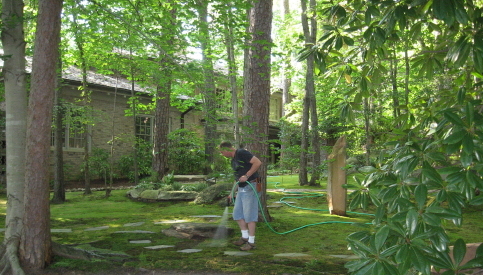 The landscape of the Urquhart residence is unique in several respects, and David Spain is keenly aware of the ecological and geological wonders of the place. 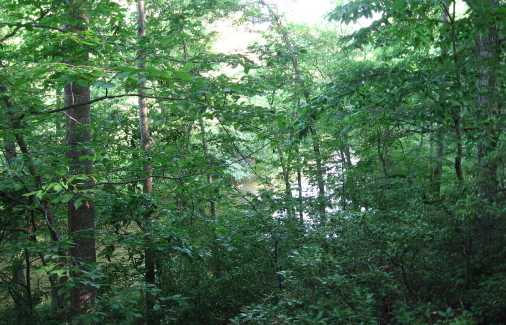 The property slopes down steeply to the deep stretch of Crabtree Creek just northwest of the dam. There is a rich stand of mountain laurel on the slope, and above the moss garden and water park of large pools, waterfalls, and huge rocks. 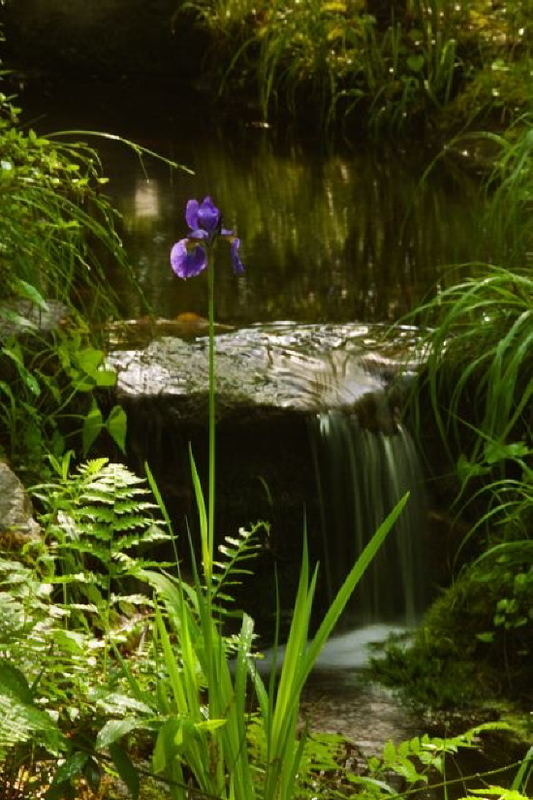 The rocks were unearthed by creek erosion out of the slope, and the Urquhart family has pried them out, hauled them up the hill, and used them to create a magnificent setting for the plants and water. David puts into Crabtree in his canoe about as often as I THINK about doing it – which is pretty often- and gets some great pictures, which he has shared and consented to have on the site. 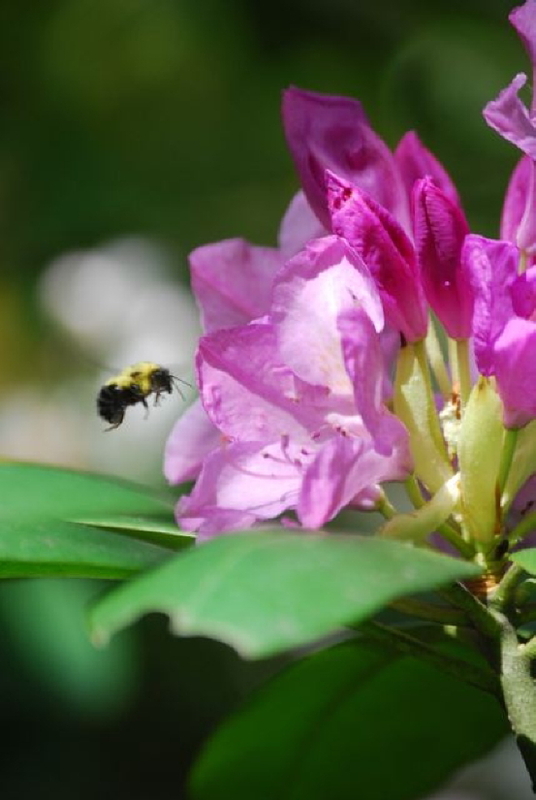 Enjoy some great sights of Raleigh Nature courtesy of David Spain, whose hard work and dedication is maintaining one of the most interesting and valuable residential natural areas in central Raleigh. What a brave poplar tree! 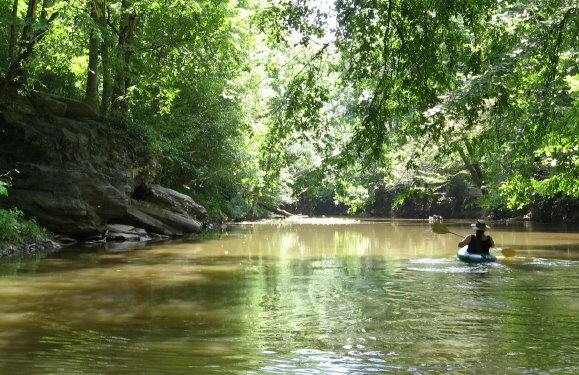 David can walk the creekside and offer endless lore and history about the area. His contributions and friendship have been a big reward for my work on Raleigh Nature. Below is his picture of the Urquhart front yard. I’ll share my own photography of the site when it’s time to celebrate the Southern Living shoot, which was arranged by local super-gardener Helen Yoest, whose acquaintance I made at the shoot. Her Metro feature on the Urquhart garden is a great introduction to the site, and it will be fun to see how Southern Living shows off the garden and David’s meticulous work with the moss. A related fun tidbit: I received a while back the photo below, which depicts what the senders states are gears from Lassiter Mill. He asked for advice about who might be interested or what might be done with them. 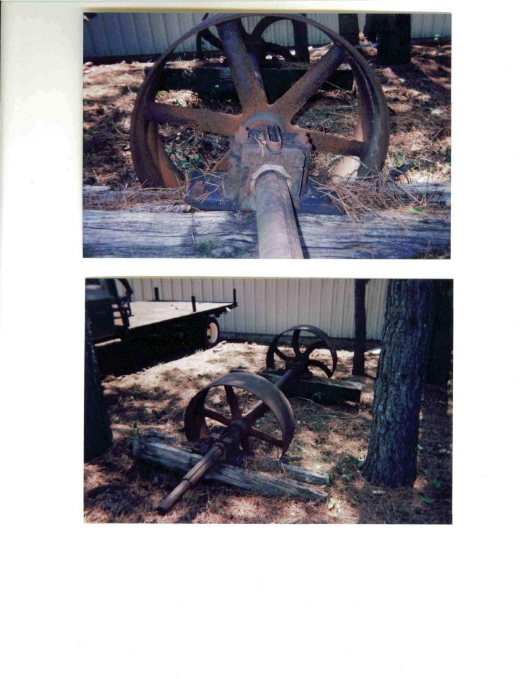 I thought I would post the picture and give my contacts at the Raleigh History Museum and Yates Mill Park a heads-up. Any ideas? Well, Raleigh Nature is a year old – and haven’t we been through a lot, and boy, have I learned a lot! 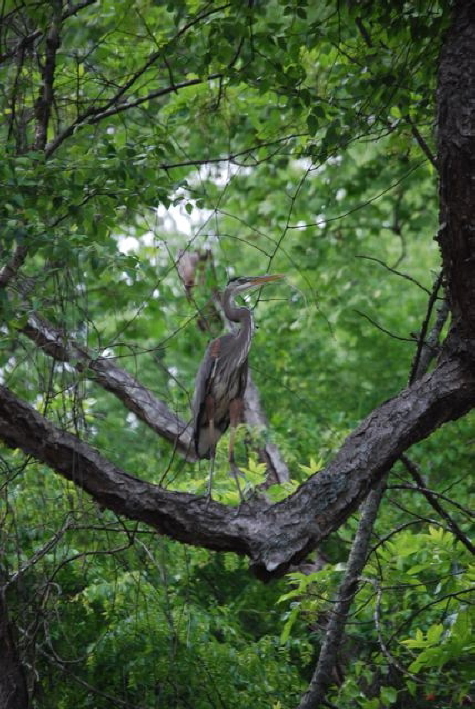 This blog is just getting started in ways – more broad coverage of ALL of Raleigh ITBL, pages on invasive species, turtles and record trees, and addressing concerns and questions from readers, are all on my list. But it was a good year and I’m very happy with the blog and most grateful for the responses. Above is a Google Earth snapshot of what this blog is really all about – lost in wilderness inside the beltline – in this case, the woodlot off the greenway at Atlantic Ave and Hodge Road, which was recently destroyed. Let’s enjoy them while they’re here! 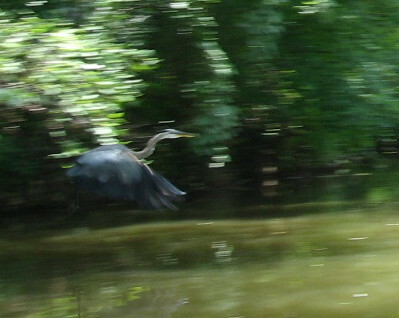 Below are my Raleigh Nature favorites for 2008. 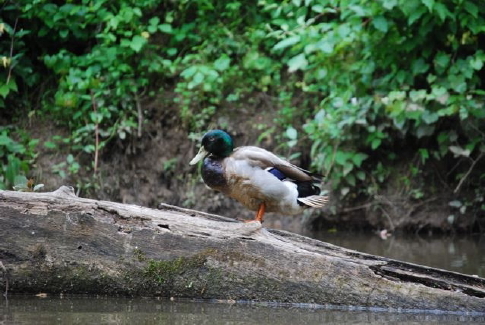 My favorite place to sit on a log. 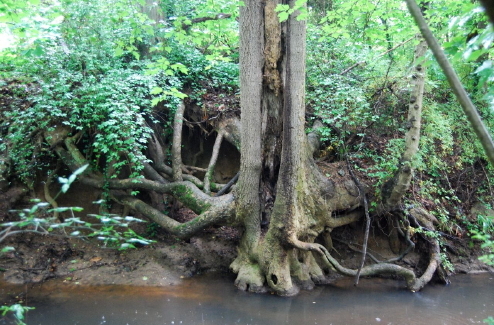 Amidst the large tree stands that line Buckeye Trail, the oldest and easternmost section of Raleigh’s greenways threads its way beside the deep meandering banks of Crabtree. Here we are looking at the spot where Marsh Creek marsh spills over into Crabtree after a heavy rain. Nice spot for animals to come down for a drink, and above is the marsh skyline to scour for hawks and herons. My favorite spots to drown worms. 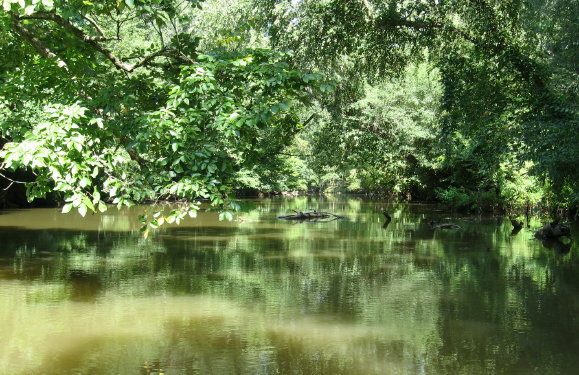 Lassiter Mill, above and below the dam, is a wonderful place to fish with children, for turtle food, or even to fool around with your flyrod. My favorite place to take a guest. Yates Mill, with the old millworks, the gorgeously built new center displaying its history, a marked tree i.d. 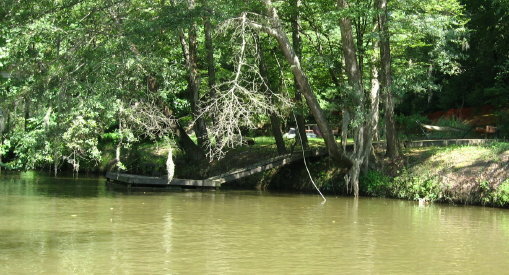 walk, a high ridge, a marshy meadow, and a fishing deck, has all anyone could desire from a nature outing. It’s well outside the beltline but I love it too much to exclude it. My favorite place to meadow tramp. 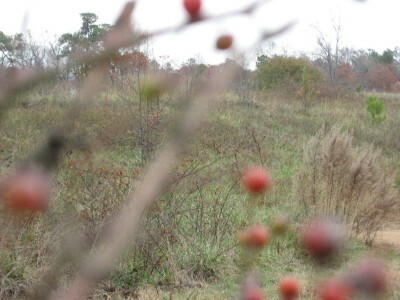 The privately owned section of the old pecan farm surrounding Jones Lake is eventually doomed but is the best spot for seeing foxes, deer and footprints of those and more in the same trip. Once it’s developed, I’ll have to settle for the county park across the highway. My favorite place to jump rocks. Dix and the greenway that connects it to Centennial and Washington School represents a fantastic dog walk, frisbee throw, pecan pick, or walk of any length you desire. Rocky Branch, displaced by the Western Boulevard extension, has retained some of its good character. 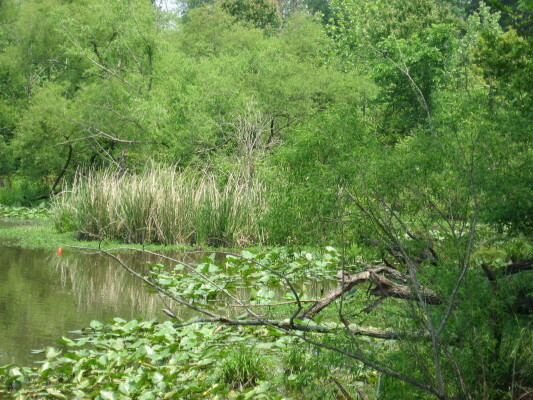 Raleigh Swamp, which used to be irregular but has been made permanent by the damming effects of Raleigh Boulevard, has a large consistent and varied population of breeding and visiting birds. My favorite place to listen to water. 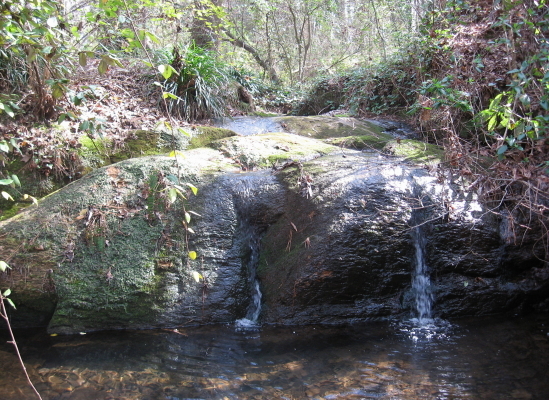 Jaycee park has a rock waterfall that, at two feet, is perhaps the largest inside the beltline. It certainly is the prettiest of which I know. My favorite place to photograph.